Courtwood Inn is nestled in Murphys alongside the middle portion of the California Sierra Nevada Mountain Range. The majestic mountain range supports one of the most diverse temperate conifer forests on Earth and is home to thousands of plant and animal species. Within the Sierra Nevadas, you’ll find three National Parks, two National Monuments, dozens of wilderness areas, and nine National Forests. This range provides a stunning richness of ecology and natural wonder, making a foray into its boundaries a must during your visit. Keep reading to find out which are the closest National Forests to Murphys, CA. There are two different National Forests and one National Park within an hour or two of Murphys, CA: Eldorado National Forest, Stanislaus National Forest, and Yosemite National Park. 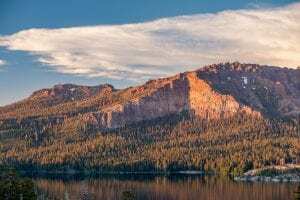 The Eldorado National Forest is home to sparkling lakes, rugged wilderness areas, steep canyons, and breathtaking hikes that lead you through pristine landscapes and to lofty summits with panoramic views. In addition, there are miles and miles of fishable streams, and an abundance of rainfall means that there are also several awe-inspiring waterfalls in the Eldorado Forest. We recommend: hiking the Horsetail Falls trail. It presents a challenge but rewards you with scenic views and a rushing waterfall. The Stanislaus National Forest is one of the oldest National Forests in America (it was established in 1897!). There are many pristine lakes and streams where you can fish, swim, go boating, waterski, or even windsurf. Trails through the towerings forests can accommodate hikers and mountain bikers. 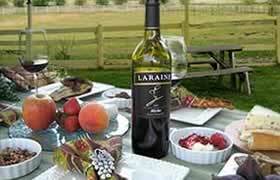 Bring a picnic with you, and you can recover as you enjoy delicious food and incredible views. We recommend: visit the Bennett Tree if you’re visiting between June and October. This is the largest known juniper tree in America, at more than 80 feet tall! 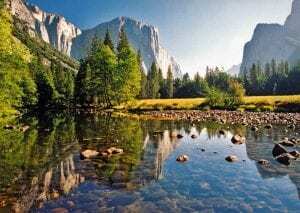 Such a grand description leads you to expect an unforgettable time, and the sights at Yosemite do not disappoint. Dramatic, craggy mountains rise out of lush greenery, and sweeping vistas will fill you with a sense of awe. We recommend: get a glimpse of the highest waterfall in America! Yosemite Falls plunges over 2,400 feet to the valley below. The best time to visit to enjoy the falls is during spring when the melting snow feeds into the streams. 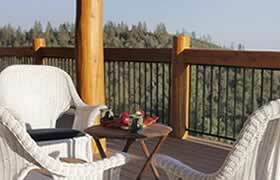 Courtwood Inn is a beautiful eco-friendly lodge nestled in Murphys, CA. You’ll be within a couple hours’ drive from some of the most beautiful natural environments in the country while avoiding the crowded bigger cities. When you relax on the deck at Courtwood Inn and look out over the valley, you’ll feel miles away from the hustle and bustle of the everyday. Take a look at all of our gorgeous rooms, and book your stay today!